I’ll cut to the point here, and I’ll explain much more about the health benefits of gelatin tomorrow, but I invented fruit snacks made out of wine yesterday (at least in my mind I invented them—maybe it has been done before?). They were amazing. So, I refined the recipe a little, and made them again today… and they were even more amazing! 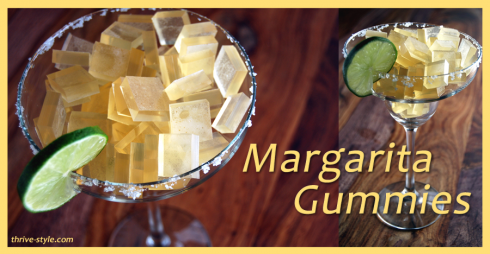 If you like wine gummies, you’ll love margarita gummies too! Click here for the recipe. Watch this video for more information about gelatin’s superpowers! Happy #WineFriday! Cheers to wine and you and fruit snacks! can these be made with a moscato or sangria ? A plane won’t work unless you want to be arrested for open container and possible transportation for sale to boot. I assume you’re referring to the use of gelatin… I am going to try it agar powder, which is a vegan gelatin-alternative made from seaweed. I wonder if you can use agave nectar instead of maple syrup? For vegetarians, use agar-agar instead of gelatin, as gelatin is made from bones and hides, “animal by-products.”. VEGETARIAN OPTION: Use agar-agar, as gelatin is made from animal by-products. 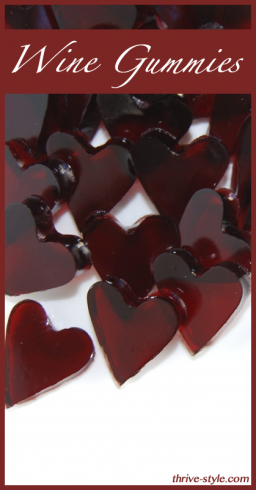 Use agar-agar instead of gelatin. I wonder if agave syrup would work. Thanks for being the vegan gelatin pioneer Lara. Can’t wait to hear your results. Okay, they’re in the fridge now (I did the simple, pour-in-the-pan method.) They’re not very red, but I think that’s more due to the wine I used (sweet muscadine) and the grade A syrup, it’s very dark. So we’ll see how this works! If it works out, I’m going to make some with grape juice or apple juice for the kids. Yum! I hope you love them! Okay…so attempt #1 using agar powder with the same ratios as above seems to be a bust. 4 hours later and they’re still liquid. 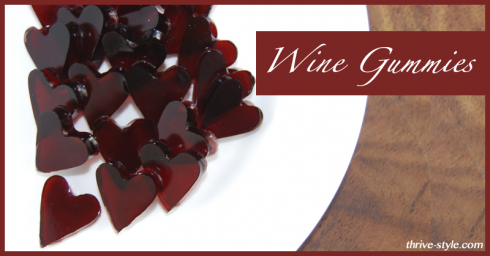 My experience with agar is that it needs to be boiled first…so if you’re trying to keep the alcohol in the gummies, you’ll need to use water or juice, and maybe boil half the liquid content, stir in the agar, then add the remaining quantity in wine. I’m going to make some using grape juice this week, which I don’t mind boiling. I’ll be back to keep y’all posted! Thanks for trying the agar agar and letting us know! I’ve tried a couple different types of red wine but each time, right when I add the first tablespoon of Gelatin it goes cloudy. Any thoughts or suggestions? So I figured this out. I was keeping my temp below 90℉ to ensure I lost none of the alcohol since I noticed a bit of steam around 100-110 when I heated my first batch (before adding the gelatin). I tried making these again with the same wine but this time after all the gelatin was well dissolved I let the heat rise to just above 100 for a few seconds. That cleared it up! I warmed up the wine, all is good. Then I added the gelatin to the wine and started mixing it. Then I added the maple syrup. my problem was that it STARTED to set as I kept mixing in the maple syrup! That’s apparently a big NO NO because once it sets, and you keep mixing it, it wont remold again… SOOOOO if you want to do this recipie, I think you should ADD SYRUP first, then add the gelatin.. Maybe add the syrup while the wine is still heating up. I will definitely try this recipe again, trying to mix the sweetener before the gelatin. Will let you know how it goes!!! Any update on your results? Well I just made these. 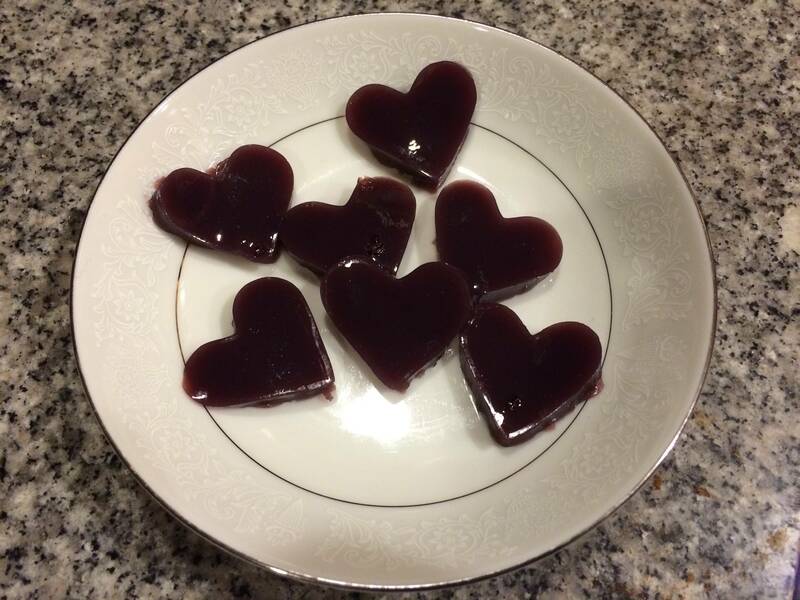 I used 1.5 cups of wine and 6 packets of gelatin (after measuring, I discovered each packet is actually a bit less than a TBS)…I just kind of poured the syrup in. They’re pretty good. I used red raspberry-flavored wine, though all you really taste is red wine and maple syrup. I poured the mixture in a round nonstick baking pan (I guess that’s what, 8″?). They set up in the fridge after a short time VERY hard. I ran a butter knife around the edge and then cut them with the metal star-shaped cookie cutter I happen to have. I got VERY VERY few stars out of it. Maybe the pan needed to be wider so they’d be less thick and I’d end up with more? They’re still cute and the real test will be when I bring them to dinner tomorrow!! Here’s the picture…left is obviously the stars I cut out and the right is what was left over. Of course I’m bringing everything with me because there’s too much to waste! I make Knox Blox (similar to Jello Jigglers) and I spritz the pan with Pam before pouring in the gelatin. I’ve never had a problem with sticking. I truly can NOT wait to try this recipe, but my gelatin is still over my daughter’s house so I HAVE to wait! I personally detest maple syrup (I know, it’s an awful thing to say!) so I’m thinking that honey would make a good substitute. Then again, I don’t care for the sweet wines so I imagine I wouldn’t need to do much in the way of alterations anyway. How well do these store and for how long? Hi- how long do these stay good in the fridge? Made these yesterday and they are pretty darn good. Just not good idea to eat all day so went and bought some good juice to make some more. I sure wish you would share with everyone just how much of the gelatin you are consuming and how long is your hair now????? These are’t new; wine gums have been popular in Britain for decades, and Chefsteps has a terrific recipe that utilizes a home version of the sous-vide technique which preserves the alcohol content, and therefore taste, in the candy. The candy will also last longer than these do. Previous post: Grain Free Waffle Brownies in 5 Minutes or Less!